Since last post I've but released several updates which improve performance and user experience of the game. And now I'm preparing the new world: Floating Islands (like in "Laputa" and other steampunk settings). Here's how it'll look like. The mechanics of this world will be as follows. You start on a single island, others are invisible. On this island you have a money producing building and a coin collector. You empower the building by rotating the cogwheel, as in the Workshop world. You can also connect more cogwheels to it to increase the transition coefficient, but you can place them only on the island. To find other islands you should build a Scouts factory. It produces the Scouts (looks like Lenardo's planes), they fly around the screen and gather Sentry points. As the Sentry points reach the certain thresholds new islands become available. In the centre of each island there is a Crystal. This crystal generates energy for the engines located on this island. The energy can be transported from one island to another using one of these connections: railroad bridge, cableway or antenna (for wireless transportation). 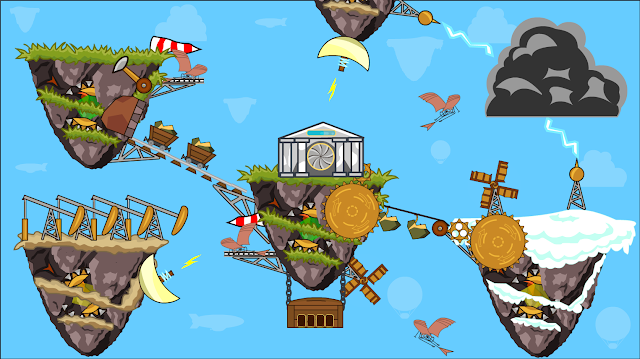 There are additional ways to generate energy: windmills and lightning rods (the latter can be placed nearby the thunder clouds). Also each island type will have a specific building, which will boost its energy production. For now I've thought of an oil well for the Desert island. What would you suggest for Grass and Ice islands? I'm afraid to promise something concrete on the update date (I tend to work better when there are no specific dates ahead of me), but from my experience adding a new world will take 40 pure working hours. And, as more players are playing my game and sharing suggestions, I tend to spend every free minute to contribute to the project. Among other news: we have a facebook group now! There are 200+ members there already, discussing the future of the game. And, just to remind you, the game can be downloaded from PlayMarker.